“After four seasons on the air, The Flashcontinues to be the one of the most popular shows on The CW,” said Rosemary Markson, WBHE Senior Vice President, Television Marketing. "We’re thrilled to offer loyal fans 25 hours of entertainment with the complete fourth season and captivating extra content." The Flash stars Grant Gustin (Arrow, Glee), Candice Patton (The Game), Danielle Panabaker (Justified, Necessary Roughness), Carlos Valdes (Arrow, Once), Keiynan Lonsdale (Insurgent), with Tom Cavanagh (Ed,The Following), and Jesse L. Martin (Law & Order). 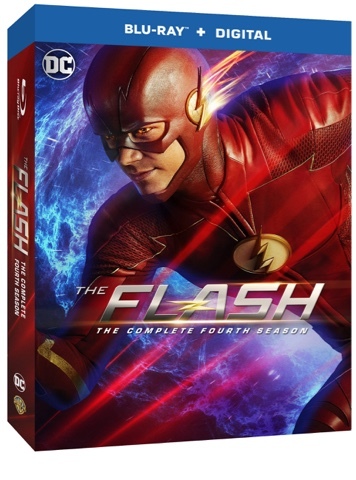 Based on the characters from DC, The Flash is produced by Bonanza Productions Inc. in association with Berlanti Productions and Warner Bros. Television, with executive producers Greg Berlanti (Arrow, Supergirl, DC’s Legends of Tomorrow, Riverdale), Todd Helbing (Spartacus, Black Sails) and Sarah Schechter (Arrow, Riverdale, Black Lightning, Supergirl). 6. "When Harry Met Harry…"
8. "Crisis on Earth-X: Part 3"
10. "The Trial of the Flash"
12. "Honey, I Shrunk Team Flash"
21. "Harry and the Harrisons"